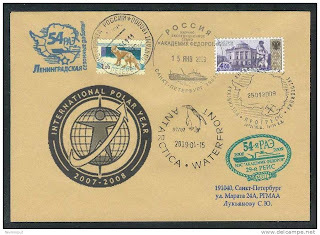 Cover with IPY 2007-2008 official logo, with RV AKADEMIK FEDOROV exploration vessel onboard cancellation dated from April, 15 2009 and special cancellation at the arrive in the Leningradskaya station on April, 25 2009. 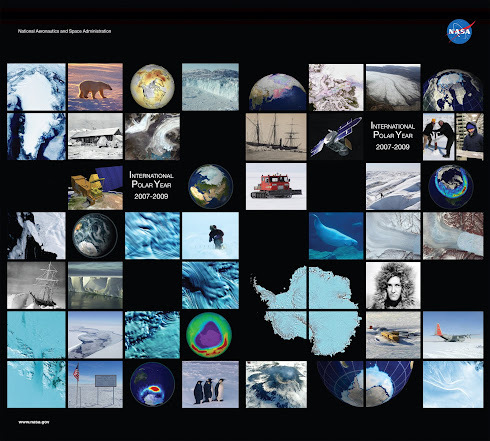 Progress (Russian: Прогресс) is a Russian (formerly Soviet) research station in Antarctica. It is located at the Larsemann Hills Oasis on the shore of Prydz Bay. The station was established by the 33rd Soviet Antarctic Expedition on April 1, 1988 and was moved to another place on February 26, 1989 In 2000, work was temporarily halted but it reopened in 2003. A landing field is located close to the station for air connection with other stations. From 1998-2001 work was done on the moving of transportation devices to Progress from Mirny Station. In 2004 work began on a year-round facility at the station. On October 4, 2008, a fire broke out at the construction site resulting in the death of a construction worker and two serious injuries. The fire resulted in the complete loss of the new structure, as well as damage to the station's communications and scientific equipment. The R/V Akademik Fyodorov (Russian: Академик Фёдоров) is a Russian scientific diesel-electric research vessel, the flagship of the Russian polar research fleet. It was built in Rauma, Finland for the former Soviet Union and completed on September 8, 1987. It started operations on October 24, 1987 in the USSR. The ship was named after a Soviet polar explorer, academician of the USSR Academy of Sciences Evgeny Fyodorov, who worked on the first Soviet manned drifting ice station North Pole-1. Leningradskaya station was a Soviet Antarctic research station, located at 69°30′S 159°23′E﻿ / ﻿69.5°S 159.383°E﻿ / -69.5; 159.383 (the north shore of Victoria Land, at the Oates Coast). It was opened on February 25, 1971 by the members of the 15th Soviet Antarctic Expedition. It closed in 1991, but during its lifetime was host to studies of meteorology, Earth magnetism, oceanology and glaciology. There are plans to open the mothballed stations Molodyozhnaya, Leningradskaya and Russkaya in the 2007-2008 season. This will bring great benefits because these stations are located in the Pacific sector of Antarctica, which is poorly covered by scientific studies.